Hartlepool College’s Celebration of Achievement Awards held on Thursday 24th November 2016, saw students scoop accolades for their outstanding work throughout 2015/16. Neale Coleman from One Awards presenting Karin Herbener, tutor at Hartlepool College on behalf of Bryan Whitelock with the Award. 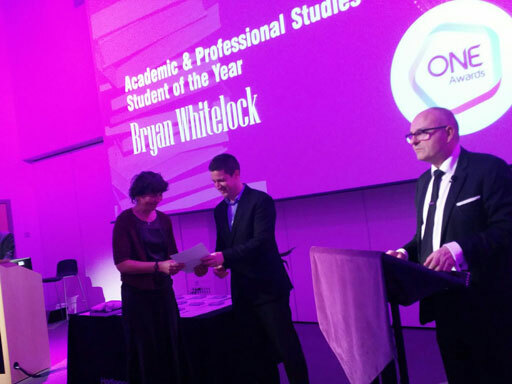 One Awards supported the event by sponsoring the Academic and Professional Studies Student of the Year Award. The Award was won by Bryan Whitelock, Bryan was a student on the Access to HE, Education Studies programme, where his aspiration was to become a teacher. His hard-work and determination led him to gaining distinction grades across the board. He has now progressed to university where he’s reading for a degree in English Language and Linguistics with Journalism. Congratulations to all the award winners, nominees and to Hartlepool College on a successful event.